But yeah, I am sure you have heard about Garnier's Micellar Water online, you may have tried to hoard it from France or the US or in the other countries it's in, or you may have received this as a pasalubong or balikbayan box prezzie from a loved one. Whatever your interaction may be with this product, I am sure you have already heard enough to be compelled enough to buy one when it hits shelves this December. My role here really is just to tell you that it's already here and that you should get your money ready. Soooo to formally introduce the product to members of the press, media, and sardines like me, Garnier invited us to a light lunch at Happy Garden Café the other day. 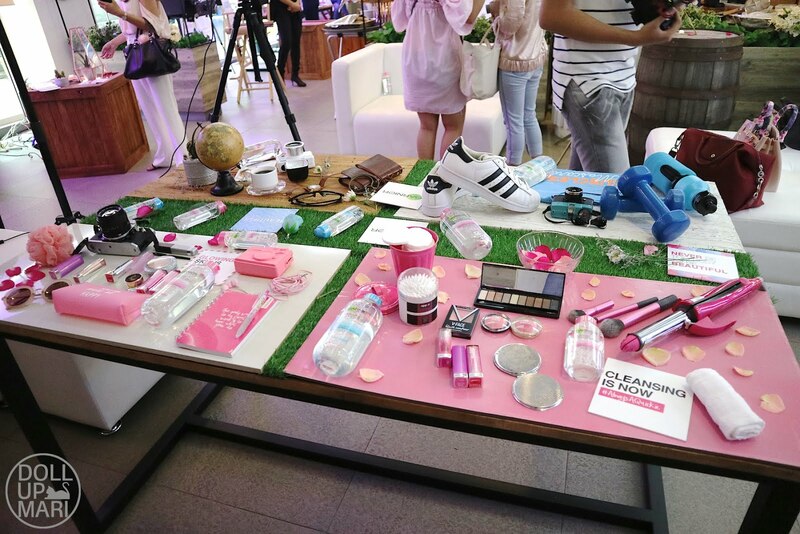 May I just say how happy I am with their whole flatlay set up? They spent a loooong time getting the venue ready because they made the whole place IG worthy! It's just trueeee. It's over!!!! I am sure that with the arrival of Maybelline and L'Oréal's micellar waters that you were already waiting for this one last baby to arrive this year. And yes it's finally here. 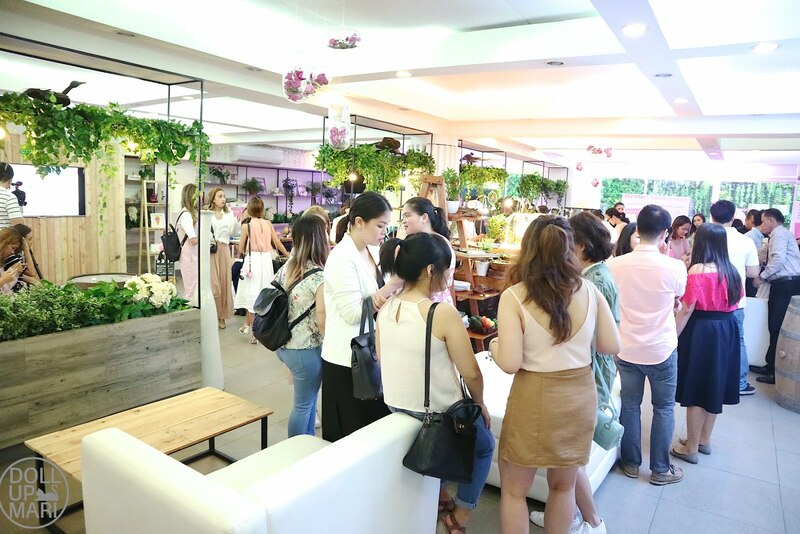 May I just say how cute the whole venue looked? It was so nicely decorated. I don't know how this resto looks like on a normal day, but it looked so gorgeous. And welll, this station is here to remind everyone that while Garnier's Micellar water is the number 1 in France and that more than 20 million units have been sold already, the Garnier universe is quite big! Here they have the Light Complete collection on display. 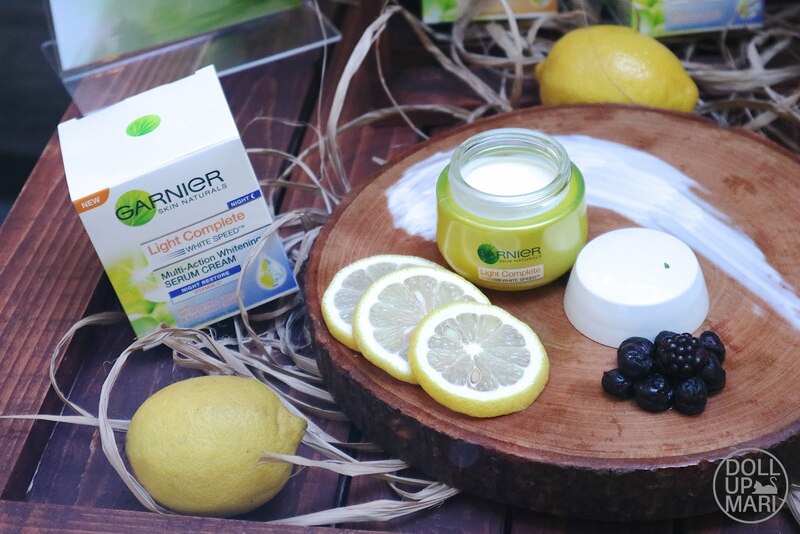 So these have the nutrients, moisturizers, and other ingredients that you would expect from Garnier's products put into this one all encompassing product. This is honestly the best gift for teens this Christmas because it's got real benefits for the skin and will help a lot of teens who are just new into skincare to get into a routine. This already functions as makeup remover, cleanser, essence, and moisturizer, all rolled into one. 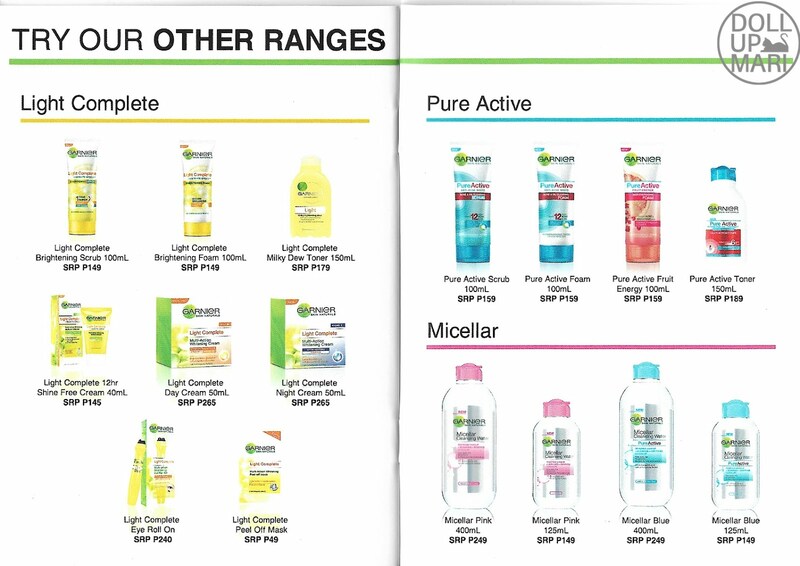 I think that the blue one will also be OK for guys because it's anti oil and it's something that will really not make any excuse for them to skip skincare. It's already everything in one product, how could they still skip it? 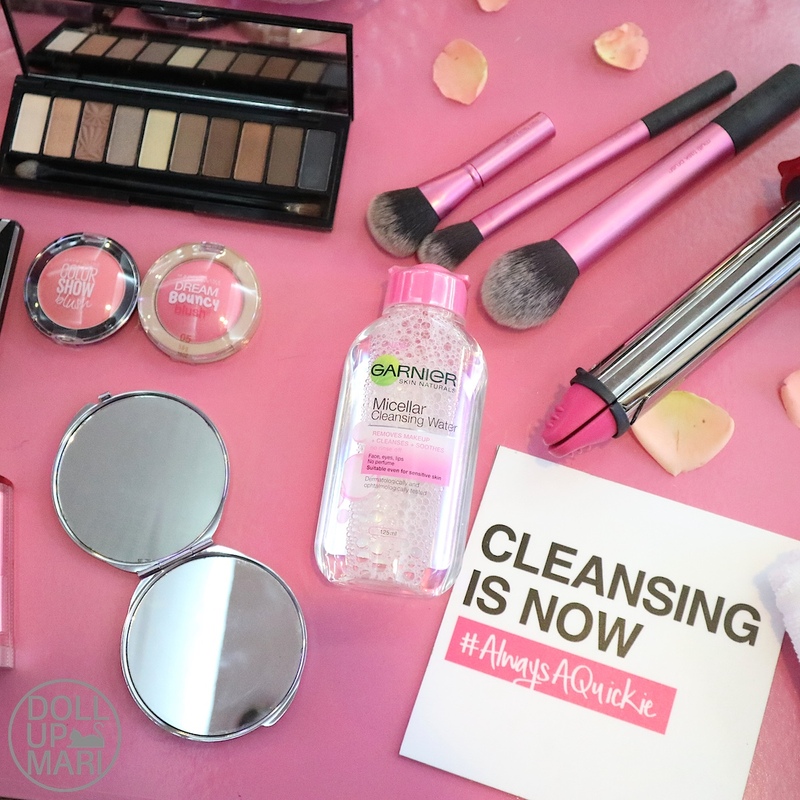 So just to demonstrate the makeup removal part coz I know you're all very excited about this, here are some of Maybelline's favorites. 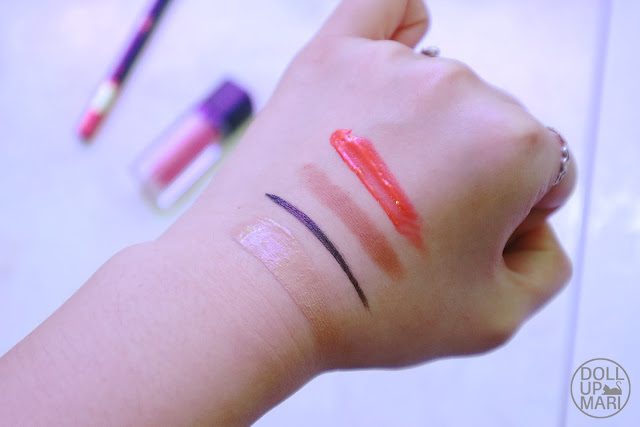 From left to right, there's Maybelline Dream Satin foundation, HyperSharp eyeliner, Contour stick side from the V-Face collection, and Vivid Matte liquid lipstick. 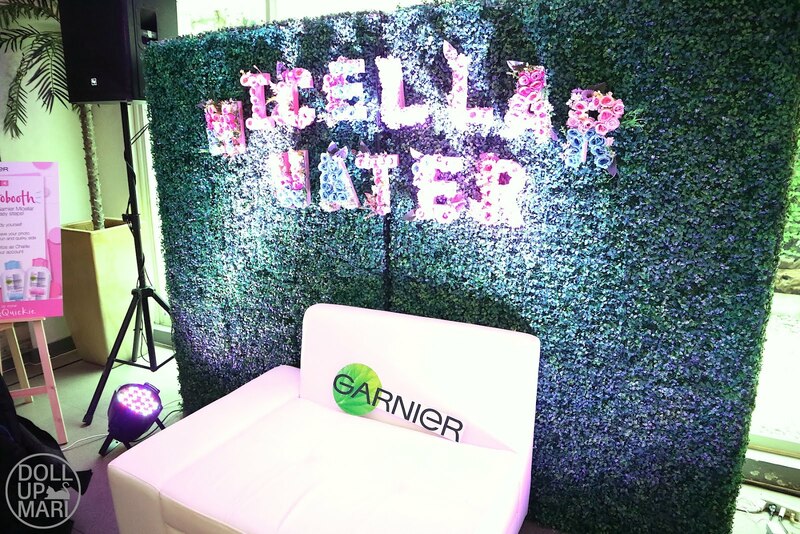 And today I am using Garnier's Pure Active micellar water. I have a pretty cotton pad which is already saturated with the product. In one swipe (with some pressure applied), everything comes off cleanly and gets onto this cotton pad. 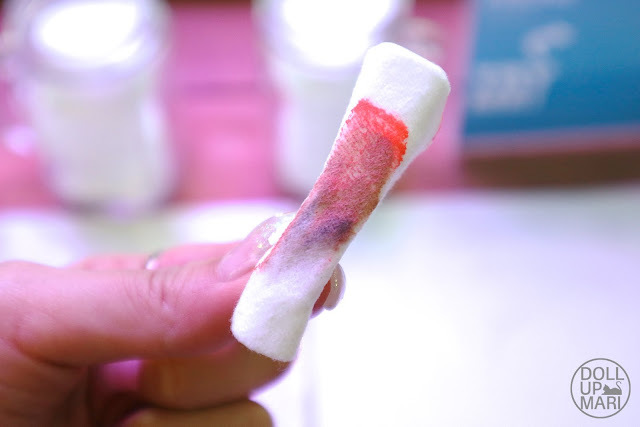 As you can see, most of the makeup is cleanly out of the way and on the cotton pad. When it comes to the contour cream, foundation, and lip cream, you can see that it all gets off cleanly. When it comes to the eyeliner, not exactly clean, though not too bad already for just one swipe. I have yet to do this on actual eyeliner on the eyes because you can only judge the ability of a micellar water to get rid of makeup once it faces the actual grooves on somone's face. So this is a giant poster that they have. It explains how micelles work. So soap comes with micelles, these spherical formations of molecules with hydrophilic heads and hydrophobic tails. The hydrophilic heads, in water, are able to absorb all sorts of dirt and stuff as they are activated. The tails trap the dirt inside the spheres, because if the tails were also hydrophilic (water loving), it would just spew out the dirt in solution. 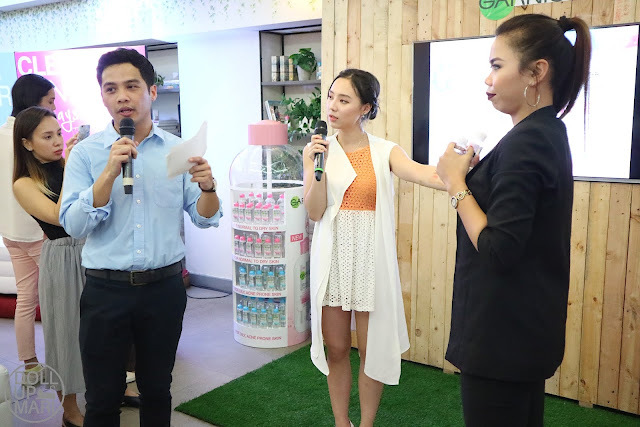 For today's activities, they had the lovely Dr. Ching Co give derma consultations to the guests. This is Genzel taking her photo. I missed her so much as it's been quite a while since I last saw her! 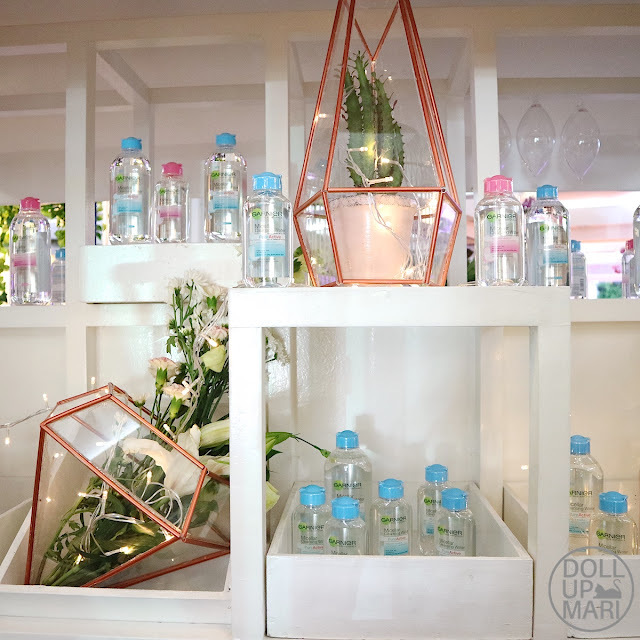 The staff behind the brand and events team got a taste of a blogger's life when they set up this flatlay station. I heard it took more than an hour just to get this ready (even if technically it may look like some random objects arranged) because in reality, flatlays really aren't easy to do. It took me years to learn how to do decent flatlays after countless of hours of research, IG and Pinterest hopping, and investing on a lot of flatlay props such as tiles, shells, gems, jewelry, fur, and the like. And let's be real, I'm still not even good at it, I'm just decent at it hahaha. And I'm also not done investing with flatlay props I just bought myself some seashells from a recent trip in China! 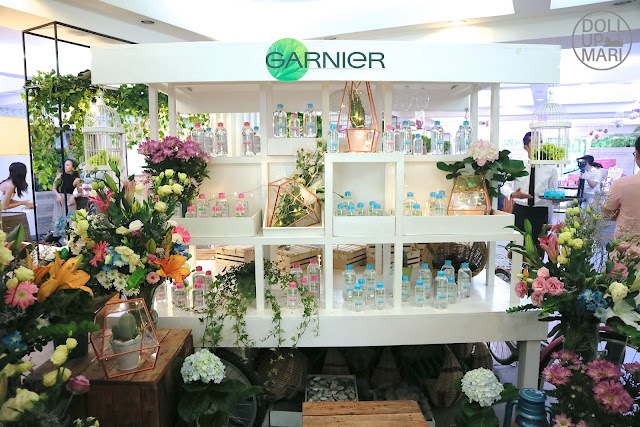 For the program proper, they were pleased to announce that while Garnier may be the newest entrant, it's actually the cheapest by far. 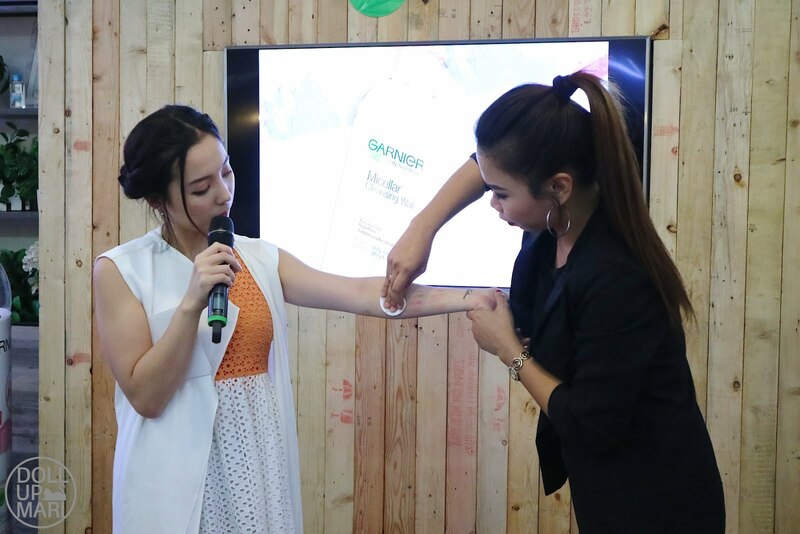 It's also a very good item for young people because it goes beyond makeup removal and is a total skincare product. They phrased it very nicely that it is the perfect product for "busy" college students, though in truth we know that what this really means is that this is the perfect product for students who are too lazy to care about hygiene because they procrastinated via binge watching [insert romcom/sitcom/drama here] and need to rush a [paper/thesis/exam prep] due for the next day. If sleep is for the weak, why not slip this already into the routine? 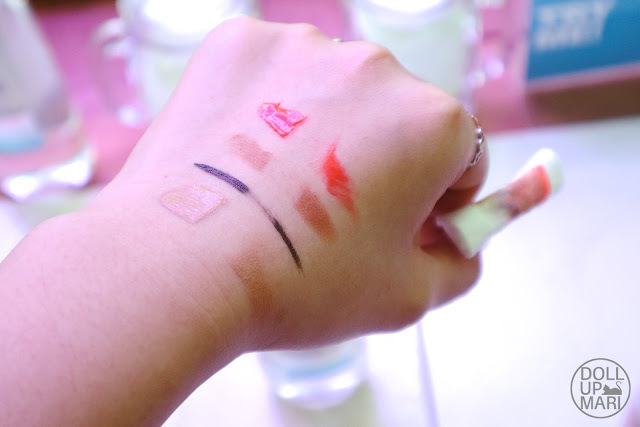 Sooo for the demo, the lovely host also had the same Maybelline makeup products I used applied on her forearm. 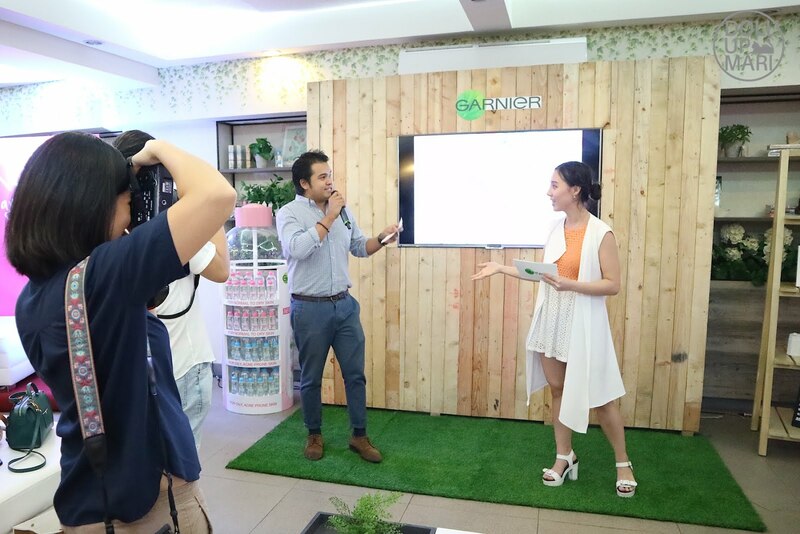 They applied it three times because they wanted to show how Garnier fared vs. competitors. Garnier, as they claim, is potent enough to get rid of makeup in just one swipe with some applied pressure. 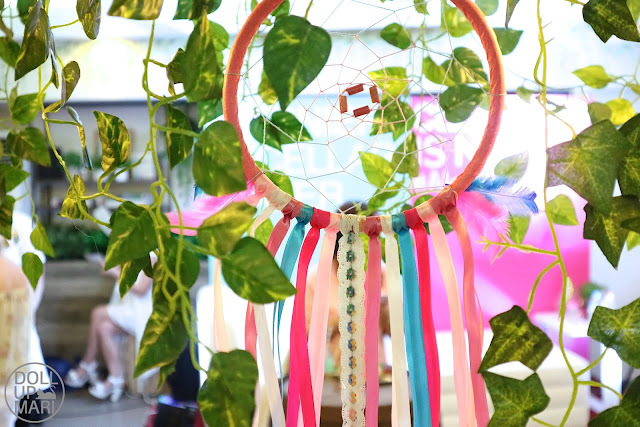 They say that their goal is to make it effective enough that applying some pressure is enough and that the user need not rub and tug the skin anymore to get the job done. 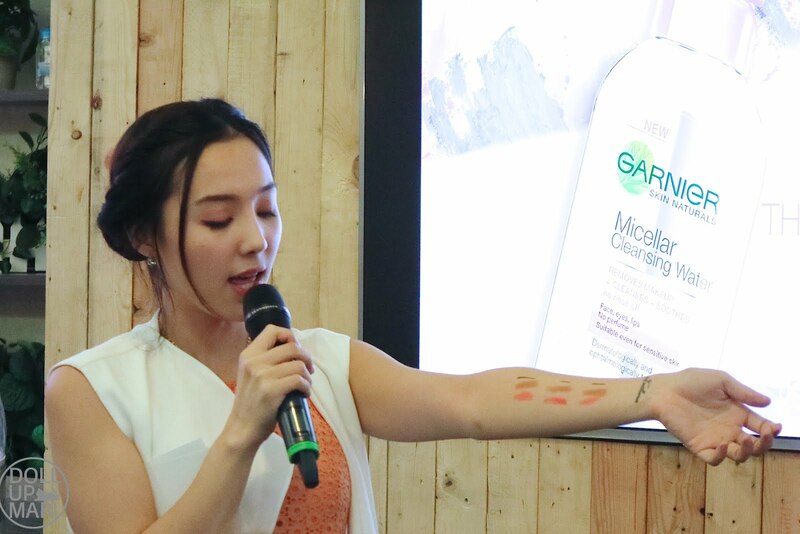 The rest is history, but you can see two sets of faint makeup streaks on the host's forearm as competitors A and B (as they were touted) were not able to get the makeup off completely. 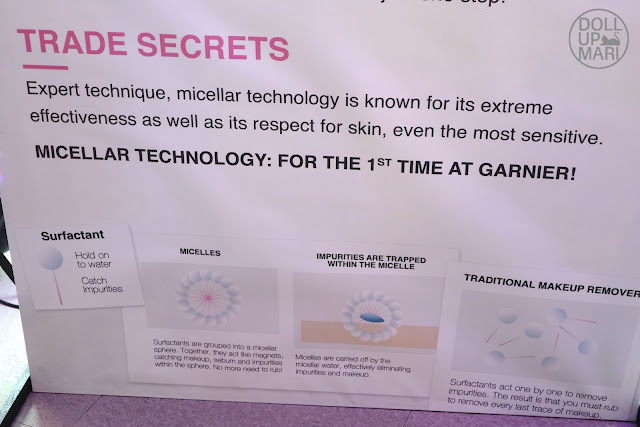 Garnier, in this demo, got rid of the makeup completely. 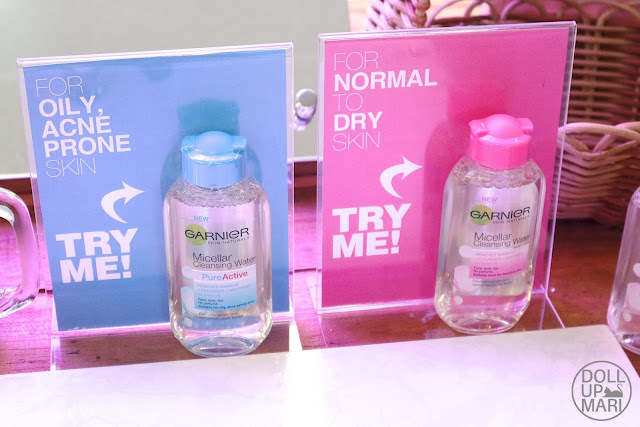 Thus far, I think that all micellar waters are more or less equally good in getting rid of makeup, but personally I feel that the two things that make this stand our are its super competitive pricing and noticeable skincare function. My skin really feels as if I had used a toner and cleanser as the oiliness is gone after using it at the end of the day. 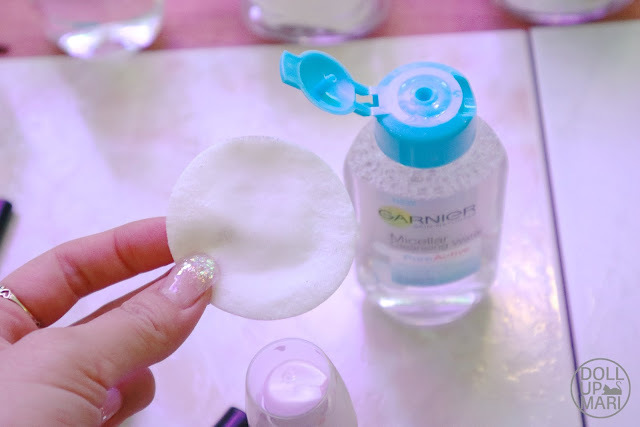 Micellar waters are very good in removing makeup in terms of color (like getting all the color pigments off of the face), but this is exceptionally good in getting rid of the excess sebum that the face had produced and also the sebum that the makeup applied had introduced. Feels wise, there's something about this. Soo for pricing, this is the cheapest thus far at Php149 for a 125mL bottle and Php249 for a 400mL bottle. 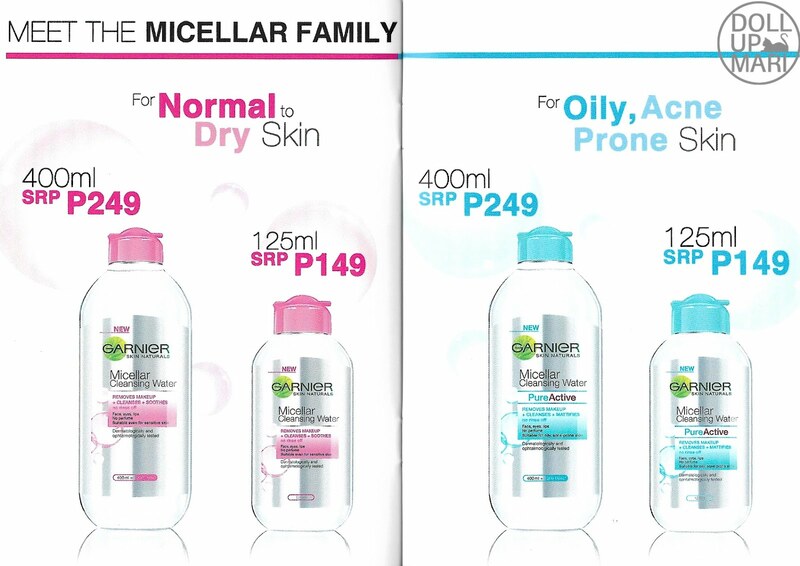 The 125mL is the cheapest investment thus far in the micellar water category, in the sense that one needs to shell out only Php149 to be able to try the product, compared to the Php200-93480934804388390984 that one would have to invest to get a bottle of competitor brands. The 400mL bottles are thus far the cheapest per mL in the industry at Php0.62/mL because the rest of its competitors are at at least Php1/mL. So yaaaay, happy holiday shopping! These will surely brighten up a lot of people's holidays (and skin)!!! 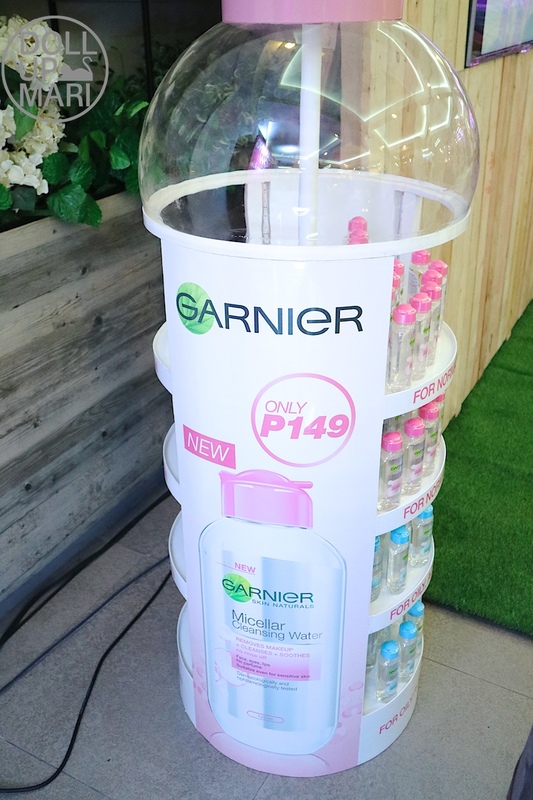 mura na plus quality product pa. Garnier fan! Been seeing this sa mga reviews and blogs ng mga SampleRoommates, and actually gusto ko rin sya itry. Maybe after holidays pag wala ng problema sa gastos. Hehe.